It is the so-called Ames' Room test, the name of the American ophtalmologist that used it to show how the human perceptive system can deceive: the mind "recognizes" according to previous experiences and cultural influences. This phenomenon can be explained by means of the second test. There are some pyramids that are used to explain why "identical" objects can look "different" and "different" objects can look "identical", if we merely look into. Each pyramid has a hole at its vertex and through it the visitor can "peep", this way simulating the action of viewing. 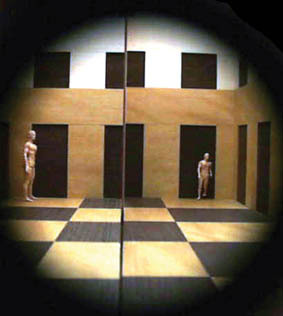 Some slots on the walls allow him to insert different pipings and to see how they look: asymmetric quadrilaterals look like square after having been put in, irregular shapes look like regular, silhouettes like those used in the first test help understanding why the Ames' Room provokes such an impression. The hand shadow game at the beginning of this part is inspired by the name matemilano and is based on the visual pyramid principle too: some mathematical signs are lighted by a dot-like energy source and throw a shadow where one can read milano. Another exhibit goes back to perspective scenography techniques: from the "correct" point of view (the vertex of the visual pyramid) the image coming out is a little table with the Galleria in the background; from other viewpoints, the whole image distorts and breaks up, like in a scenography observed from the backstage. The model of the choir of Santa Maria presso San Satiro, one of Milan churches, by Bramante (here exhibited thanks to the courtesy of Museo di Storia della Scienza in Florence), and one of the "virtual tests" shown in the workstation, refer to the theme of rebuilding the reality. The model is divided into two parts: the left part represents the perspective illusion created by Bramante, the right one represents the architectural development of "how we imagine the false choir, when we are looking at it". If we observe it from a suitable point of view, the perspective and the architecture of the choir vault compose themselves in a single picture. The virtual test allows the visitor to "go into" the scene where the Sacra Conversazione by Piero della Francesca is fit; this painting, now kept at Pinacoteca di Brera, is one of the most famous examples of perspective rebuilding. Finally a last exhibit "reverses" the experience the visitor has already done as regards the distortion undergone by an object image when it is reflected by non flat mirrors: some distorted objects are placed in front of this hemispheric mirror and they appear set up right in the reflected image.